For more insight into developments in submarine connectivity in the APNIC region and worldwide, read our submarine cable series. In 2018 we created around 2.5 million terabytes of data every day. This roughly equals 425 million HD movies a day. Any comparison is in itself massive, so it is understandable if these numbers are difficult to grasp. What’s more, data creation is growing at an exponential rate every year. All this data exists in different storage centres across the world. But I am able to access the statistics shown here, probably stored in servers in the US, while sitting in India, because of the Internet — the greatest invention of the 20th and 21st centuries. But when we think of the Internet, many wrongly assume that satellites in space keep us connected with different parts of the world. 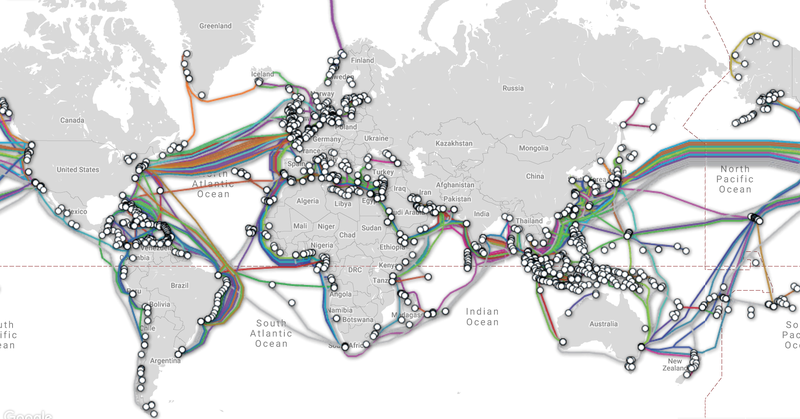 In reality, 99% of the data travels between economies and continents through undersea cables. Figure 1 — TeleGeography’s Submarine Cable Map (March 2019). But bandwidth demand is not the only reason for new cables. To understand the other reasons, we first need to distinguish between a cable’s lit capacity vs potential capacity. Lit capacity is the amount of capacity a cable is currently equipped to handle. Potential capacity, on the other hand, is the theoretical maximum capacity that a cable can support if additional capital was invested to fully equip the cable system. In most major routes, the lit share of potential capacity is less than 30%. This would suggest that we can invest in existing cables and make use of the remaining unlit capacity, but this is generally not the case. An interesting trend is increased investment by content providers in new cables. Previously Internet backbone providers were the major investors and bandwidth consumers of Internet cable. In the last five years, the cables that are partly owned by Google, Facebook, Microsoft and Amazon has risen eight-fold, and there are more such cables in the pipeline. These content providers also consume over 50% of all international bandwidth and TeleGeography projects that by 2027 they could consume over 80%. Figure 2 — Content provider investments (TeleGeography 2019). Figure 3 — Bandwidth consumers (TeleGeography 2019). Think of the undersea cable network as the new economic trade routes and the commodity in transit as data — arguably the most important commodity of the Information Age. Amazon, Microsoft and Google own close to 65% market share in cloud data storage. This makes them major exporters and importers of data. Imagine them forming an oligopoly to own the routes used to transfer any data. Of course, end consumers would benefit from reduced prices that are passed on by the content providers, who now enjoy large economies of scale from owning cables. But smaller companies looking to compete will be at a disadvantage. They, or anyone else looking to use these cables, could be charged a higher price for bandwidth. This is no different from an oil cartel in some aspects. A worse, but less likely, privacy related concern is if Facebook decides to use all data passing through their cable to ‘improve their services’, regardless of who owns the data. Don’t worry though — we are nowhere near such a scenario. Yet. Content providers are currently only part owners of cables and Internet backbone providers still have a dominant presence. But if these content providers do decide to own and regulate all cables, which they are capable of, this could very well be the future in store. The companies in question here are already more powerful than most people realize. If you need more convincing, read this article on how difficult life is without them or better yet, listen to this podcast discussing surveillance capitalism. This post originally appeared on Noteworthy – The Journal Blog. If content providers start monopolizing the new fiber they have laid down, it may result in a shift of traffic from the old pipes to the new ones. This may be actually beneficial to the smaller providers who now have access to capacity which previously was hogged by the larger players. Also, upgrading the terminal equipment could lead to breathing new life into the existing fiber, lit and unlit. > These content providers also consume over 50% of all international bandwidth and TeleGeography projects that by 2027 they could consumer over 80%. This should be “consume over 80%” not consumer.